After nearly four hours of intense discussions and passionate speeches, the Evansville City Council approved Mayor Lloyd Winnecke’s 2019 budget by an 8-1 vote late on a Monday night in October. The city budget included a $500,000 for the Affordable Housing Fund (AHF). 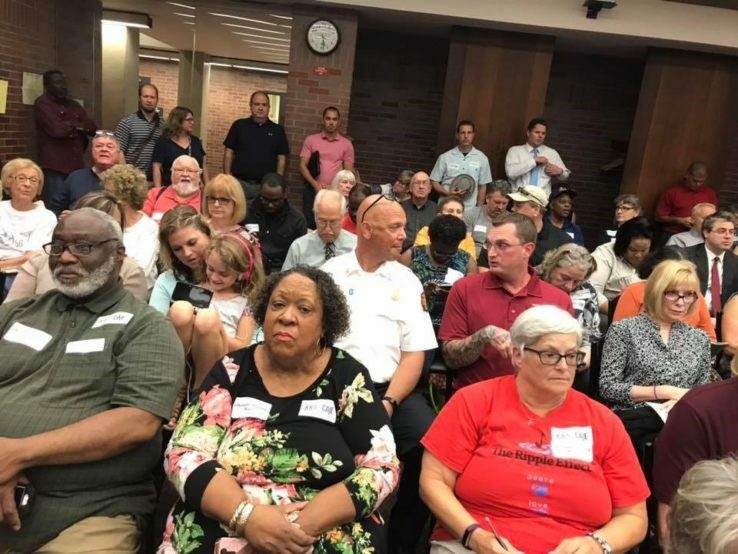 The AHTF passage was a hard fought victory for DART affiliate Congregations Acting for Justice and Empowerment (CAJE) who has been working hard for nearly four years to garner City Council’s support for revenue for the Evansville’s Affordable Housing Fund. In 2016, CAJE and allies had a promise from the Evansville City Council and Mayor of an allocation to the AHF of $500,000. Unfortunately, City Council actually only allocated $200,000 in 2017 of which half was from the city general operating budget and half from leftover capital improvement funds. City Council’s tepid action spurred CAJE to renew their efforts to secure a full $500,000 for the AHF. CAJE’s new push began in early 2018 with meetings with council members to educate them on Evansville’s need for a robust AHF. As they continued the one-on–one meetings, CAJE also turned up the public pressure with a rally in mid-April with hundreds of members pushing the Council members and Mayor to hold true to their promise. This set up CAJE for their annual Nehemiah Action in May where nearly 1,000 people from their member congregations attended to hold elected officials and administrators accountable to their agenda. At this year’s Action, CAJE members thanked the Mayor for his willingness to support the AHF at $500,000 and pushed council member to say yes to support the Mayor’s proposal. CAJE was able to get a great deal of local news coverage at their Nehemiah Action specifically about the need to fund the AHF. In order to gain more support, CAJE members attended meetings of the Affordable Housing Fund Advisory Committee, the body that oversees the AHF. What started out as a somewhat adversarial relationship, developed into a mutual understanding between CAJE and the Advisory Committee on shared values of providing the best affordable homes for Evansville’s residents. Some Advisory Committee members began advocating with CAJE members for the $500,000 funding to the AHF. CAJE and allies were ready when the City began hearings on the budget in the summer. CAJE members turned out in force at the hearings in August to urge Council to support the Mayor’s allocation of $500,000. In the last week before the vote, a couple council members introduced amendments to reduce the AHF allocation to $100,000 and to zero out the funding. CAJE members pushed back with an “all hands on deck” call through daily social media posts and member-to-member calls to the CAJE netowrk urging their members to contact council members to support the full amount of funding for the AHF. Kelley Coures with the Department of Metropolitan Development says results take time and keeping funding for affordable housing should be a top priority. “In terms of the entire budget, it’s really a very small amount of money. But I think it’s telling about priorities. It’s telling people who are at a certain income level by committing a half a million dollars to the trust fund, it’s telling those people that we are committed to helping you,” says Coures. CAJE’s win is a win for Evansville’s most vulnerable folks. CAJE’s persistence helped change the minds on City Council. In 2014, when CAJE voted to organize to address the lack of affordable homes in Evansville through reinvigorating the Affordable Housing Fund, a fund they helped to establish in 2002, there was not a lot of support at City Hall. Their journey lead from a resistant City Council and Mayor to four years later winning a hard fought victory with eight of nine council members’ and the mayor’s support. Not resting on its laurels, CAJE members are already meeting to strategize how to win a dedicated revenue source for the Affordable Housing Fund.